Honestly, I knew the term dyslexia when I was in high school or college already. We are not very much educated about it then, so thankfully we have these kinds of talks today. And as a mom, I am very much thankful to people who share there knowledge to us. No parent would ever want to see his child struggle in school much more in the area of reading—the very core foundation to learning every subject there is in school. This is far worse for the child. The fear of being labelled and teased as stupid, dumb and slow is something he has to face and live with every single day. It could even be aggravated by his teacher’s perception of his condition: lazy, not trying hard enough, unfocused, and absent-minded. The fear even becomes bigger when the school strongly implies that the child is simply a poor student. There’s got to be a way out. What could be the real reasons behind his difficulty in reading? What can be done to help a child who struggles in reading? 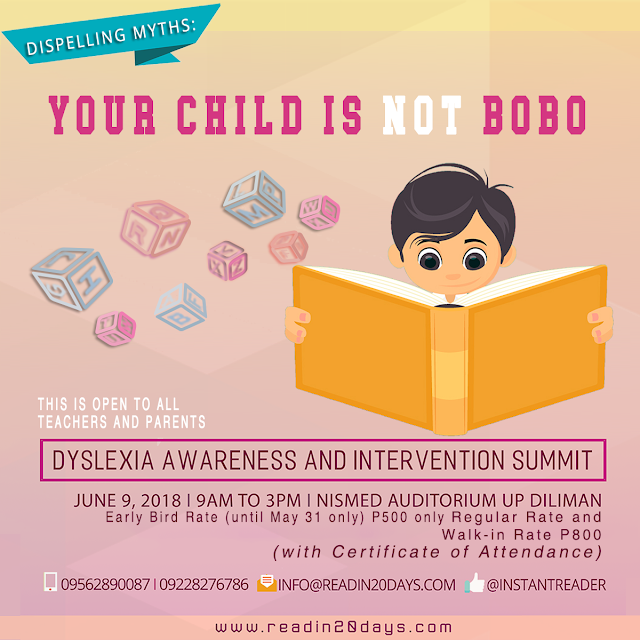 Happening this June 9, 2018 at the National Institute of Science and Mathematics Education Development (NISMED), UP Diliman from 9am to 3pm, the Dispelling Myths: Your child is NOT bobo. A Dyslexia Awareness and Intervention Summit is designed to help parents, teachers, school administrator and counselors to understand the condition that is Dyslexia and the need for it to be identified as early as possible as it can hinder a person’s learning and has negative, long-term social consequences, not only for the individual but also for the society. ReadRight, Inc., the developer of the Instant Reader™ Program is the pioneer and the only research-based system that can make any non-reader and non-English speaker read and speak English the fastest and most effective way. Instant Reader™, with its academically-rich headquarters inside the UP Los Baňos campus, has proven for almost fifteen years now that any average non-reader child can be taught to read in just 20 days or even less through a revolutionary and unique program that enhances student reading abilities and love for learning without initially teaching the classical English alphabet. Having been directly involved in various researches and programs concerning the teaching and learning process of children and adults, the team behind Instant Reader™ is consistently and actively trying to respond and do its part in uplifting the growing global delusions concerning the real state and premise of reading and literacy. 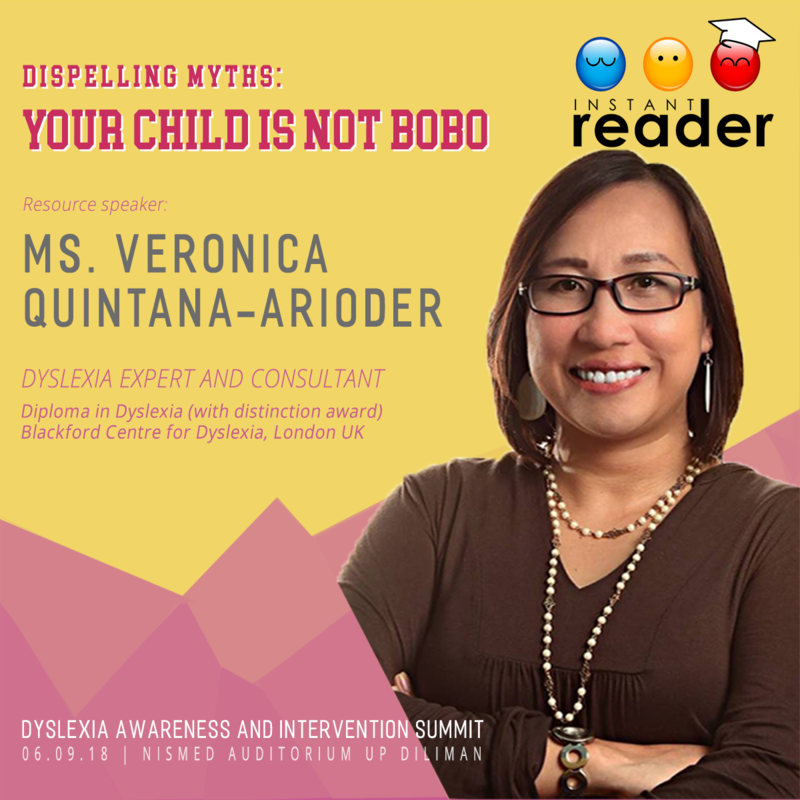 The resource speaker is the founder and developer of Instant Reader™ Ms. Veronica Quintana-Arioder. Ms. Arioder finished her Diploma course in Dyslexia (with Distinction Award) at Blackford Centre for dyslexia in United Kingdom and would be sharing her expertise on the said area, imparting up-to-date information on language literacy learning difficulties which affects several of our students inside the class. Hi! Thank you for keeping up with my blog! Care to share your thoughts? And I'm a mother blogger.